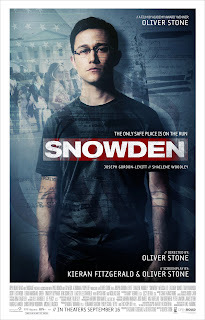 The story of Edward Snowden (here played by Joseph Gordon-Levitt) is one that should shock and almost burst with energy and excitement and thrills. It's the true story of how one man turned against the entire U.S government to reveal to the world that illegal software was being used to spy on U.S citizens in their daily lives in an attempt to source criminal information. I remember the story breaking back in 2013, and when I heard that it was to be adapted into a feature length film I was excited to see how it would be portrayed. Unfortunately, the portrayal of this story is Snowden's biggest flaw. Director Oliver Stone is adapting a shocking and powerful story, one that should almost pulsate with tension and energy, yet he tells it as if it's little more than a man finding a spelling mistake in a book. While I understand Stone's attempt to quieten this story down and focus on the small stuff, it hasn't worked here. Rather than playing the story small he has instead played the story safe, and no film about this kind of thing should ever be played safe. Snowden bizarrely spends a lot of time focusing on Edward's journey through the CIA and the beginning of his relationship with Lindsay (Shailene Woodley). A good half hour passes before the film finally decides to be dedicated to this story, and even then it only offers fleeting moments of this. Snowden is told through frustratingly orchestrated flashbacks, opening in 2013 with Edward meeting the journalists to break the story, then unfolding the rest piece by piece. While this kind of storytelling can allow for smart contradictions or characters saying things that are disproved by what the film displays next, Stone fails to capitalise on any of this. Instead, it falls victim to almost all of the tropes that this narrative structure always suffers from; namely, a lack of tension and awkward pacing. The first act is woefully slow, and doesn't really find anything interesting about Edward to buy us into him as a protagonist. After this, it leaps from tone to tone with little guiding us through it all, feeling more like a series of scenes rather than a flowing narrative. It never settles into one thing long enough for us to find solace anywhere. Thankfully, frustrating storytelling is Snowden's biggest issue, and a number of other elements in the film help to keep things mostly on track. The cast are uniformly great; while Gordon-Levitt is the notable standout, Woodley is also on form as his girlfriend, elegantly capturing the emotional trauma she was forced to experience across the whole ordeal. Melissa Leo and Zachary Quinto also work well as the two passionate journalists trying to break the story in the present, and smaller turns from Nicolas Cage and Rhys Ifans round the solid cast off nicely. The soundtrack succeeds in adding tension to scenes that the sloppy narrative has burdened; one particular moment in the film's final act is horribly predictable, but the pulsating and offbeat score is enough to make you forget the sketchy storytelling for a while. There is some nice cinematography too, with computer digitalised sequences not taking up anywhere near enough time considering how well realised they are on screen. Snowden may be seriously hampered by its poor storytelling and lazy direction, but the story that it does tell remains mostly captivating simply due to how shocking the real thing is. So even when Stone is pulling his own film away from greatness, there's always something there that makes you keep watching. To Summarise: Despite lacklustre and severely uneven storytelling, Snowden finds strength in the facts, as well as terrific performances from its well rounded cast. Haha yup he's pretty perfect for the role! Thanks for reading!